The Protector UTM Firewall comes fully loaded with Anti Spam - Web Filtering - Anti Virus - Firewall - VPN - Intrusion prevention read more here. Click below to find all the different reviews and awards for Protector VPN Appliance. Get your risk free demo evaluation virtual software today. The Protector UTM Firewall is available as a powerful 1U Rack mountable appliance with high speed Network interfaces up to 40 Gbps. Being the #1 solution with large amount of new firmware updates always keeping the product up to date and ahead of the competition. Contact us today for an evaluation version and be able to evaluate the Protector UTM Firewall yourself. Sign up to a Webex Webinar session to get a detailed presentation of all the Protector UTM Firewall features. It is also possible to obtain a Protector UTM Firewall for testing purposes. Contact to get more information. 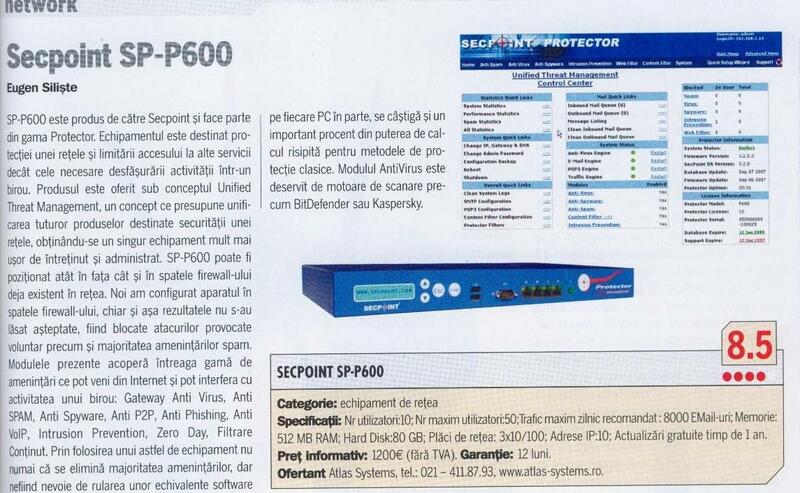 The SecPoint Protector scores 8.5 test score where the closest competitors score maximum 8.0.